One of the joys of summer is eating ripe, organic, homegrown tomatoes, still warm from the sun. The quality is incomparable to the bland, mealy tomatoes that are usually available in supermarkets. The good news is that even if you don't have space for tomatoes in your garden — or don't have a garden at all — you can still grow tomatoes. As long as you have a sunny balcony, porch, or patio, you can have garden-fresh tomatoes all summer long. There are three keys to successfully growing tomatoes in a container: choosing the right tomato variety, proper planting, and ongoing care. Pay attention to these three areas, and you'll be in tomato heaven in no time. Anyone who has seen tomatoes growing in a garden knows that they tend to be huge, sprawling plants. They require staking, caging, and pinching to stay manageable. So, the first thing to do when considering growing tomatoes in a pot is to find a variety that thrives in container culture. While you can grow almost any type of tomato in a container, some are more adaptable and easier to manage than others. Look for a compact, bushy, non-vining plant that is an indeterminate variety, which means that it produces fruit fairly steadily throughout the growing season. (Determinate varieties tend to produce all their fruit at the same time.) Most tomato varieties are indeterminate, including cherry and many heirlooms. To find out whether a variety is determinate or indeterminate, check the plant tag or catalog description. After you find the perfect plant, it is time to plant it. In general, plastic or fiberglass pots are best for growing tomatoes for a few reasons. Plastic and fiberglass, unlike clay pots, don't dry out quickly, and while tomatoes love heat, they don't like being dry, and dry soil is a huge detriment to fruit production. Tomatoes need to grow in a reasonably large pot. A pot must be 8 inches deep. That's the absolute minimum. A 12- or 16-inch pots is even better. Plastic is inexpensive, even for huge pots, and it's unlikely to break the way clay so often does. For a cheap option, you can plant tomatoes in a five-gallon bucket (readily available at home improvement stores). They are a perfect size, and the price can't be beaten. After you have the perfect pot, make sure that it has adequate drainage — the tomato plant will rot if it is sitting in soggy soil all the time. Most purchased pots have drainage holes in the bottom already, but if you're using a five-gallon bucket, drill several holes in the bottom. If the pot you are using has large drainage holes, use a piece of a broken pot, a piece of window screening, or a paper coffee filter to cover it. This way the water can drain out, but the soil won't end up all over the patio. Any good quality organic potting soil works for tomatoes — don't use soil dug directly from the garden. It is too heavy for container gardens, and it compacts more as the season goes on. Good peat or compost-based soil, whether purchased or mixed from your special recipe, is ideal. When planting the tomato, put some soil in the bottom of the pot and set the tomato plant in. Bury the stem to just below the lowest set of leaves. New roots grow along the buried section of stem, making for a healthier plant. After you have the plant set at the proper level, fill in around it with potting soil, patting down lightly as you go. The soil should go up to about an inch below the rim of the pot to allow room for watering. After it's potted, give the tomato plant a proper watering and set it in place. 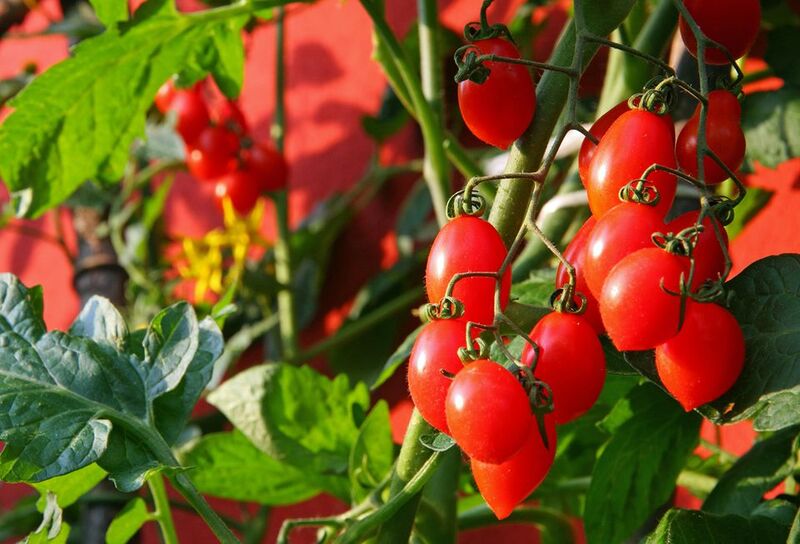 Tomatoes need moisture, so be sure to water regularly. The best way to tell when to water is to stick your finger into the soil — if the first two inches are dry, it's time to water. The trickiest thing about growing tomatoes in a pot is that they are heavy feeders, and every time you water, you wash nutrients out of the soil. To combat this, fertilize regularly, preferably with either fish emulsion or seaweed extract. Once a month is good, but every other week, applying the fertilizer at half-strength, is better. This provides a constant source of nutrients for the tomato plants. Two other things to consider are mulching and support. Even compact tomato varieties benefit from some support. Tomato cages, stakes, or homemade cages made to fit the container are all good options. Mulching, while less important in a container than in a garden bed, is still a good idea — it keeps weeds from growing in the tomato pot and retains moisture so you won't have to water quite as often. The best mulches are pebbles, bark mulch, and straw. If you prefer to use black or red plastic, position it over the soil before you plant the tomato, cut a slit large enough to put the plant in, and secure the plastic with metal stakes.